Introducing Miramus Ltd – my new company! If you want to know what I’m up to at the moment, you can head over to Miramus.com where you can read all about my new business. I’ve set Miramus up as a catch all company for all the exciting projects I’m working on, and as the launch pad for a few personal projects I’m formulating, so expect the company’s output to be quite diverse! There’s a blog on the site too, which should give you more information about clients I’m currently working with. I’m one of London’s 1000 most influential people! 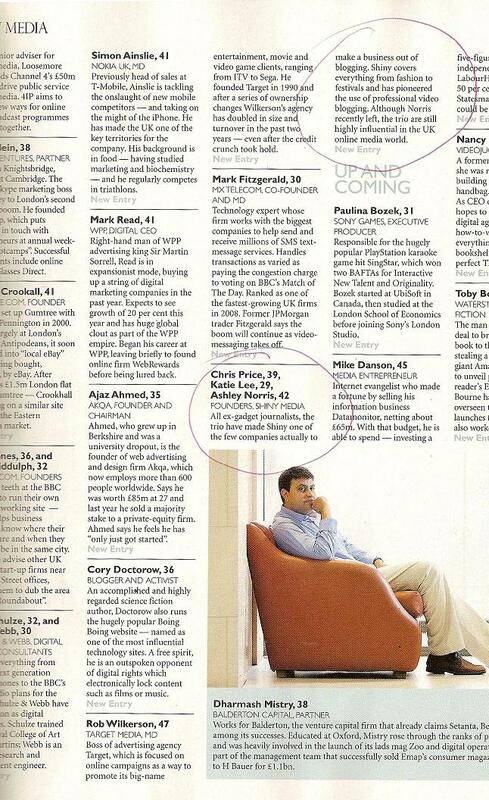 The Evening Standard has named me one of London’s most influential people in New Media! Along with my co-founders, Ashley and Chris, I got to celebrate with the likes of Boris Johnson and Gok Wan at the Wallace Collection a few weeks ago. More about it all over on the Shiny Media blog (or click on the image to read the full entry). Don’t worry, I plan on using my new powers for good. So who am I anyway? I co-founded Shiny Media, the UK’s biggest blog publishing company in 2004 with 3.1million unique users a month (you can read the full blurb about Shiny Media over on our company blog). In 2007 we took investment from Bright Station Ventures. As editorial director, I created and launched over 35 blogs for the network with titles across the Lifestyle, Fashion, Technology, Games and Sports sectors. I managed a team of 11 in-house editors and more than 50 freelance writers and editors. Some of our flagship blogs include Tech Digest, Catwalk Queen,, TV Scoop and Shoewawa. I was also founding editor of Shiny Shiny back in 2004 (the world’s first gadgets blog aimed at women), which now receives over 300,000 uniques a month. I worked on many commercial campaigns for blue chip advertisers, creating bespoke, web-friendly partnerships with clients such as Vodafone (Vodafone Live Guy, Vodafone Live Shopping), LG (The LG Media Talent Award, City Clickers) and Cisco (Digital Cribs). Both the LG and Cisco campaigns were extended into Europe using our relationships with European blog networks. I started life as a technology writer, producing a monthly column for the The Independent on Sunday Review, The Observer and Custom PC. I have also written for Woman & Home, Mobile Choice, Stuff, T3, Marie Claire, PC Pro, Blueprint, the Guardian, FHM, Dazed & Confused, and most of the daily newspapers. I’ve made numerous TV and Radio appearances, including The Gadget Show (discussing gadgets for women), Something for the Weekend, Radio 5 Live, Radio One, Radio Four and 6Music. I still accept freelance work that interests me and currently write a weekly column for Look Magazine. You can find out more about my freelance work by clicking on this Freelance link.